The water damage Tarpon Springs and mold removal Tarpon experts with 911 Restoration Tampa are available 24/7/365 to assist homeowners with their water damage emergencies. We aim to reduce the chance of acquiring mold or additional structural damage by guaranteeing a 45 minute response time. Always prepared, you can rely on our techs to arrive geared and equipped, ready to get to work as soon as you decide to work with us. At the first sign of a water leak or mold growth in your home, call the water damage Tarpon Springs and mold removal Tarpon Springs with 911 Restoration Florida. We truly care about the safety and well-being of our local community. When our customers make the decision to work with us as their one stop restoration shop, we make sure to put our best foot forward. Since it takes a pool of water no more than 45 hours to become contaminated with mold and bacteria, the water damage Tarpon Springs and mold removal Tarpon Springs make sure our repair work is done properly and efficiently. Our water damage Tarpon and mold removal Tarpon experts work together to ensure every area of your home is inspected properly and all stagnant moisture and bacteria are removed. With the help of high-powered water mitigation machines and advanced drying equipment, we don’t miss a beat. 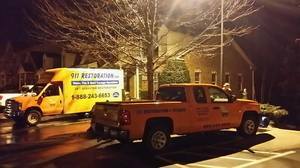 We work around the clock to make sure your home is restored even better than its original condition. Additionally, progressive technology such as infrared cameras help us detect moisture where it is not visible to the naked eye. Areas such as wall cavities, in ceilings and underneath flooring. We don’t miss a beat, so if you find your home facing the threat of a water damage or might have mold growth as a result of past incident, call the water damage Tarpon Springs and mold removal Tarpon Springs experts with 911 Restoration Tampa. Understanding your homeowner’s policy is something that you hope you never have to use but when it comes to major repairs, knowing what you are covered and not covered for will help you make decisions. We pair each of our customers with an experienced project manager who helps with everything from scheduling your same day service appointment to helping you file your insurance claim. This way we become the funnel between you and your insurance company and you don’t have to wait for answers. Our team will get you fast solutions with little turn-around time, so you can have peace of mind. Avoid a high repair bill and the hassle of multiple repair jobs. Call the water damage Tarpon Springs and mold removal tarpon Springs experts with 911 Restoration Tampa for your Fresh Start, today!